1K. S. Rangasamy College of Technology, (Autonomous) - Trichengode. The purpose of this paper is to provide a secured locker security system based on RFID, PASSWORD, CONVEYER and GSM technology which can be organized in bank, secured offices and homes. This system allows authentic person only can be recovered money from locker. The implemented locker security system based on RFID, PASSWORD and GSM technology containing automatic movement of lockers system which can be easily activate, authenticate, and validate the user in real time for secured locker access. The RFID, PASSWORD, GSM and HEAT SENSOR provides the advantage of high security than other systems. In general terms, RFID is an object or person identifier using a radio frequency transmission. In electronic terms RFID is an electronic method of exchanging data over radio frequency waves. With RFID technology we can identify, sort, track or detect variety of objects. R Srinivasan, T Mettilda, D Surendhran, K Gopinath, P Sathishkumar. "ADVANCED LOCKER SECURITY SYSTEM." 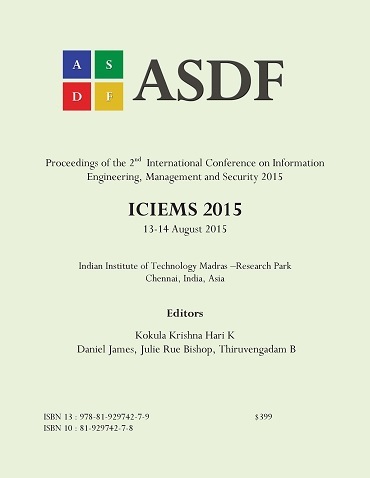 International Conference on Information Engineering, Management and Security (2015): 12-16. Print.